SiteLab is a registered US trademark by flow measurement professionals with more than 37 years of experience in flow measurement and flow standards, 34 years of which have been in the ultrasonic flow measurement field. We are pioneers in the ultrasonic flow measurement industry and possess many years of experience valuable to our customers. We are innovative and on the cutting edge of ultrasonic technology with some revolutionary measurement techniques being introduced that will bring very high precision and true real time measurement. SiteLab is devote to make the liquid resource effective use, provide energy saving and emission reduction, reduce liquid resource loss. To measure accurately and coming up with the overall plan to promote the liquid resource use effectively. Flow measurement products have different measurement errors when the flow is changing. SiteLab ultrasonic flow meter products have the very superior technical performance.When the Reynolds number>4000, the measurement errors are stable. 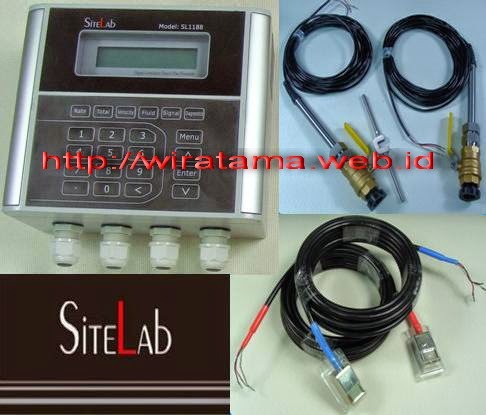 Sitelab ultrasonic Flow meter is a state-of-the-art universal transit-time flow meter designed using SLSI technology and low voltage broadband pulse transmission. While principally designed for clean liquid applications, the instrument is tolerant of liquids with small amounts of air bubbles or suspended solids found in most industrial environments.